from Dean Friedman's new CD 'Squirrels in the Attic'. ORDER your copy now and join Dean's EMAIL LIST to be notified of upcoming releases. 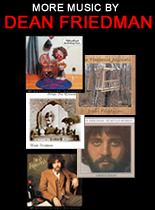 Visit Dean's website www.deanfriedman.com to hear more great songs! If you enjoyed, 'I Miss Monica', check out Dean's hilarious animation, '4 More Years'. Help keep this website going! Hey, bandwidth ain't free, you know.